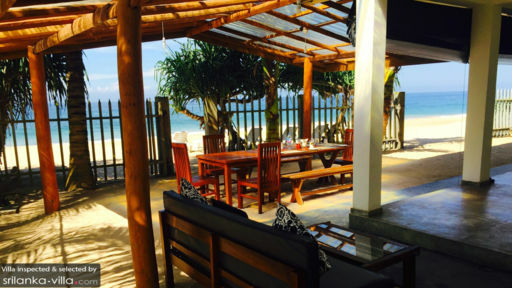 Experience the best of beachfront living at Sunset Reef Villa. Wake up to sweeping vistas of the golden shores and turquoise waters of Ambalangoda, a coastal town set in the south of Sri Lanka. Enjoy being located just a skip away from the beach, where lazy sunbathing sessions and leisurely beach strolls are part of the experience. 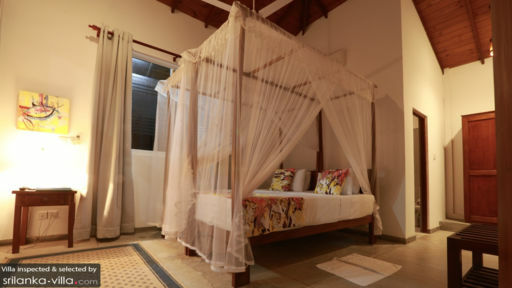 Four bedrooms are spread out across two floors at Sunset Reef Villa, each outfitted with amenities like king beds, tea making facilities, cable TV, sofa sets, private en suites, air conditioners, ceiling fans and spacious verandahs. Enjoy views of the ever-changing seascape from your private verandah; during the day a colourful fishing fleet cruises across the glistening waters, and as dusk falls the coast comes alive with twinkling lights from the fishing boats. A sparkling pool glistens under the sun, inviting vacationers to take refreshing dips in the water through the day. A gated fence frames the outdoor compound, where you’ll find a veranda equipped with patio lounge furnishings and an eight seater dining table set on the coast - a perfect feet-in-the-sand venue for al fresco meals. Relaxation comes easy in the expansive, airy living spaces of Sunset Reef Villa. The indoor lounge invites vacationers to curl up with their favourite reads or catch up on movie marathons, and the upper floor verandah is the central hangout for al fresco meals and sundowners. Enjoy impeccable service from a housekeeping team of seven, including a personal chef with much experience in cooking up a feast of international and Sri Lankan dishes. Guests may undertake culinary lessons with the in-house chef. Sunset Reef Villa is a full-service property. Personal guest services and 24/7 security service are available free of charge. Services available at additional cost include: airport transfers, vehicle rental, personal driving services, child minding services, laundry, in-villa massages, and personal chef services (for lunch and dinner). We are just back from a wonderful family holiday in Sunset Reef Villa. The Villa, with its huge comfortable beds and fantastic drench showers compliments the beautiful location. Udith the manager and all the staff were fantastic, so kind, knowledgeable and attentive. Upul our driver took us on some amazing trips, so helpful and always delighted to show us everything about his country (so much to see and do). We enjoyed the excellent food especially the Sri Lankan dishes (compliments to the Chefs) served to us by Bongala who attended to our every need. The party that Udith arranged for our sons 16th birthday was brilliant, the BBQ, bonfire, fireworks, music and birthday cake; we all had a great night. We have so many wonderful memories and photos of a fantastic family holiday, what a wonderful country and beautiful people. 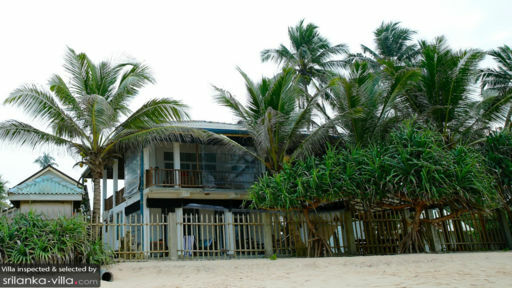 Back to reality now but looking forward to our next visit to Sunset Reef Villa which we hope wont be too long. We would highly recommend Sunset Reef Villa. We stayed here with our children and grandchildren for 2 weeks in Feb. and had the most fantastic time. The villa was very comfortable and had everything you needed but the setting was wonderful.Our villa overlooked a pristine, quiet beach and every night you went to sleep to the sound of the waves.Truly idyllic. Udith and his staff are unbelievable in the way they take care of you with suggestions of where to go ,what to do and if you happen to mention you like a particular food hey presto it is there.The staff are obviously very fond of children so it is the place to go with babies as it so free and easy. Udith is a great help if you are planning any trips, he sorted us out with a wonderful trip for a few days but believe me it is hard to drag yourself away from Sunset Reef. Thank you once again for a very relaxing holiday, we were so sorry to say goodbye to you all.